Being primarily a monitor engineer, the role I play behind a console is unique. For instance, unlike Front-of-House, the artist hears every move I make during the course of a show. This puts me in an interesting position, where anything I do has the potential to influence the artist’s performance, for better or worse. I have seen so many shows where the artist looks like they are ready to kill their monitor engineer because he can’t get their mix right. If the artist actually had faith in them (their monitor engineers), they wouldn’t feel distracted and be torn away from their performance to think about EQs and crowd mic rides. They would just trust him to take the initiative and handle it. I think this really leads to defining the number one job for me as an engineer: to build relationships. If the artist feels like they can trust me as a person, then they’re a whole lot more likely to trust me with their monitor mix. Mixing in-ears for Lincoln Brewster has been the biggest proof of the high value of relationships to me. The job is definitely not what you might expect. Lincoln, a producer and studio engineer himself, knows exactly what he wants to hear. And I mean exactly. His mixes need to start as a great-sounding album mix, definitely not an easy square one when I’m in different rooms every week. I will say, I was definitely a little intimidated at first, but I quickly got over that. As I built a relationship with Lincoln as a friend and as person, we built a high level of trust in our artist-engineer relationship as well. And now, on the road or at Bayside Church where he leads worship, it’s grown to the point where he doesn’t feel the need to come to soundcheck at all; again, because of the trust that we’ve intentionally taken the time to build. Lincoln Brewster says, "Aaron has changed the way I experience playing live. My in-ear mixes are simply ridiculous. Honestly, I feel spoiled!" It’s also important for me to have a great relationship with other engineers, especially my counterpart out at FOH. And both at Bayside and on the road with Lincoln, that’s Lee Fields. We’re friends outside of work, so we have a relationship before we even walk into the venue. We also approach most sound decisions the same way, and this makes a big deal because of my responsibilities setting up the stage on the road. He knows that when he walks up to his console the source mic placement and patching will be exactly what he’s expecting. That trust is huge, enabling us to really cooperate on making the overall sound of the event as good as possible. For example, I get to use the crowd mics as they’re intended; I know that if I ride them up in Lincoln’s ears, since there’s a great mix out front, nothing is going to be poking out and wrecking the monitor mixes. I get to dynamically open up and tweak his mix in this way largely because Lee and I are going after the same sound; our mixes work together really well. 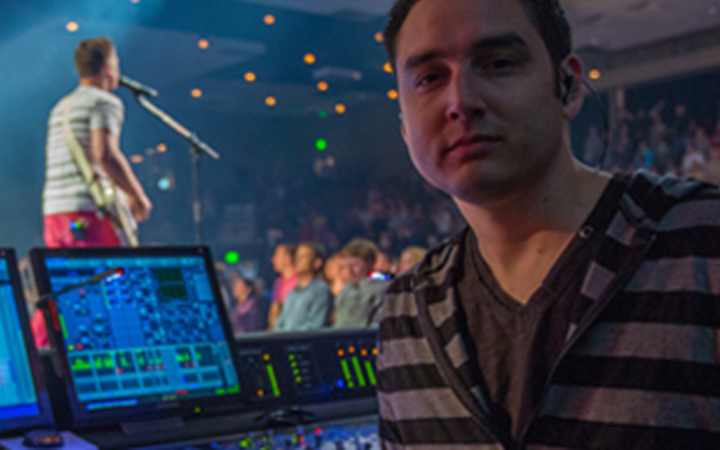 Lee Fields, FOH for Lincoln Brewster and Bayside Church stated, "Having Aaron on our team is like cheating. His attention to detail, killer mixing, and relationship skills make him the most valuable guy on our team." This kind of effort on the sonic side of things at Bayside helps to elicit the same response from all our first-time guests; walking into a service feels a lot more like walking into a concert than a church. We run full production for all our services, including a touring lighting rig and 26 box line array. A typical weekend at Bayside will draw about 12,000 people to the six services in the main room, not including multiple services at five additional venues around the region. We definitely ramp it up for holidays, too; at Christmas we drew 40,000 people to 15 services, and Easter wasn’t far behind. Running monitors in a house of worship environment is a little different than in a typical live setting. Instead of having the same band or artist all the time, you have different musicians and singers swapping out every week. It really keeps you on your toes and forces you to keep your chops up. Since it’s critical for a band or worship team in this environment to read and respond to the moment that’s evolving onstage, it’s important that you’re actively working to enable this, too. In my mixes, most of that is accomplished by the way I incorporate the crowd mics into the mix. Crowd mics, especially in a worship environment, can take a band’s in-ear mixes from sounding like a dry, closed off studio room to a full, engaging, live album mix. There is a lot of touch and a lot of habits involved that you develop over time; For example, I never leave the crowd mics up in someone’s mix for the whole set. It can make the mix sound washed out and actually make it way harder for someone to hear their instrument or voice. Instead, I treat crowd mics as an instrument that is playing a part. Just like a guitar channel getting musical solo rides, knowing when to bring this fader up and then back down is a good chunk of the battle. Traveling on the road, I see a ton of different consoles, both analog and digital, so I always have to be at the top of my game. And the great thing about the digital age in live sound is that, because of my show files, I’m able to plug in my flash drive, set gains, and start from 90%. Using Waves plug-ins has drastically raised the level of just how dialed a digital starting place like this can be, a huge asset to me as a monitor engineer. Working for an artist with a studio engineering background, I need to be able to provide a genuine studio console sound, on every console, every time. Waves really gives me that ability. I’m completely obsessed with the SSL 4000 Collection. I put it on every channel. 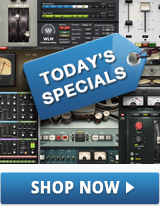 So essentially because of this Waves bundle, I mix on an SSL desk anywhere I go. Having a legitimate analog sound without the crazy amount of outboard gear is fantastic. I can’t carry a 4000 E on a flight, but I can carry on a laptop with MultiRack. And when I need to take our live recordings into Pro Tools to mix for broadcast, I immediately reach for the Waves API 2500 Compressor and V-Series EQs, and since my live SSL presets work just as well over speakers as they do in in-ear monitors, I’ve got a broadcast mix up in minutes that I know is going to translate. Speaking of channel strips, one pattern I see a lot among modern engineers is that, since everything is digital now and they have a ton of control, a lot of guys will grab the Q and make their EQ dips super narrow. Having a lot of control like this doesn’t always mean it sounds best to use it. I guess if I had a little secret it would be to always leave the EQ in a more analog mode and use a wide Q. For me, that really gives the channel more of a “console” sound and avoids the “sterile” sound a lot of us are always trying to avoid. My live effects setup is also super simple. I just use three verbs, one each for Drums, BGVs, and Lincoln’s vocal. Growing up as an engineer in smaller churches, I learned to not get super picky with gear. I’ve just always had to make whatever I have available that day sound great, quickly. Today, with far more tools available to us as engineers, I adapt that same approach and think, whatever tool will get the best sound, fastest, wins. And easy to use, great sounding effects like Renaissance Reverb are winners in my book. At the end of the day, Lincoln doesn’t care how I choose to set my mixes up, but what he does care about is that my rig is dialed and not more complicated than it needs to be. So I always try to take the simplest approach in my mixing, rather than trying to add all the crazy fluff. This may not be the right approach for everybody, but it seems to work great for me.